However, after softly stroking the ring for a little while, Jiang Cheng then forced himself to restrain that faint trace of hostility. Although he was very unhappy, he was still there in the capacity of the clan head. He still had a lot of things to consider. He couldn’t be impulsive like this youngster, Jin Ling. Ever since the decline of Qing He Nie clan, nowadays within the three remaining aristocratic families, both the Lan Ling Jin clan and Gusu’s Lan clan had become extremely close thanks to the sincere personal friendship of their clan masters. He stood alone with the Yun Meng Jiang clan. In the three clans it could be said that he was in an isolated state of affairs. Hanguang Jun Lan Wangji was a very highly revered sect celebrity, his elder brother Zewu Jun Lan Xichen was Gusu’s Lan’s clan head. Both brothers always got along well, it was impossible to tear them apart, it would be best to not start a fight. But then again, Jiang Cheng’s sword “San Du” together with Lan Wangji’s sword “Bi Chen” had never formally fought before. He had no way of knowing who would emerge the victor. Although he still had his ring “Zi Dian” which was a family heirloom, Lan Wangji’s qin “Wang Ji” also had an impressive reputation. What Jiang Cheng utterly couldn’t tolerate was to place himself at a disadvantage. If he didn’t have the certainty of grasping a complete victory, he wouldn’t consider taking action against Lan Wangji. Jiang Cheng sneered: “No need!” Choosing the opposite direction, he walked his way down the mountain. The visiting official silently followed behind him, a frown marring his features. In his heart he knew that there would be unavoidable punishment in his future. His voice was low and magnetic, if it were any closer, it would surely elicit an electric shiver in the heart of the person listening. After the juniors jointly answered in the affirmative, they didn’t dare to stay long and walked towards the depths of the forest. Wei Wuxian thought to himself, that Jiang Cheng and Lan Zhan (1), really were two completely different people, even their orders for the younger generation were completely different. While thinking, he suddenly saw Lan Wangji turn towards him and nod briefly. He couldn’t help but to be slightly surprised. This person, Lan Wangji, from young had always been serious. Rulebound to the point that it made your teeth ache, solemn and inflexible, it was as if he’d never had a lively moment. Not allowing the least bit of sand to rub in his eyes, he did not approve of the issue of Wei Wuxian’s use of necromancy. Lan Sizhui must have informed Lan Wangji of his suspicious acts at Mo family’s village, however he still nodded to him in greeting. It could be assumed that he was thanking him for assisting the Lan clan’s younger generation with breaking the trap. Wei Wuxian at once without thinking also returned the courtesy. When he raised his head, Lan Wangji had already disappeared from view. He paused, then turned around and walked down the mountain. No matter what kind of prey lay within Dafan mountain, he now could no longer pursue the issue. Wei Wuxian would fight against whomever, but he wouldn’t compete with Jin Ling. Unexpectedly, it turned out to be Jin Ling. From among the many disciples in Lan Ling Jin clan, he really didn’t expect he would end up encountering Jin Ling. If he had known, how could he have ridiculed Jin Ling with “Truly you had a mother who birthed you but did not raise you”? If someone else had spoken these words towards Jin Ling, Wei Wuxian would have taught this person the meaning of loose lips. But this condemnation had actually been his own words. Standing still for a moment, Wei Wuxian raised his hand and slapped his own face. While the donkey snorted and grumbled, from the end of the hillside came a wave of cultivators. After the 400+ bind immortal nets were destroyed by Lan Wangji’s flying sword, those suppressed cultivators in Fujiao who had originally hesitated in town all once more rushed back up the mountain. These people were all considered to be Jin Ling’s rivals. Wei Wuxian thought for a moment whether or not he should crush their intentions, but after thinking he decided to quietly step aside. Wei Wuxian slowed his steps. After walking for a while, suddenly Wei Wuxian began to hear the sound of running water. This was the first time he’d heard the sound since he’d arrived. 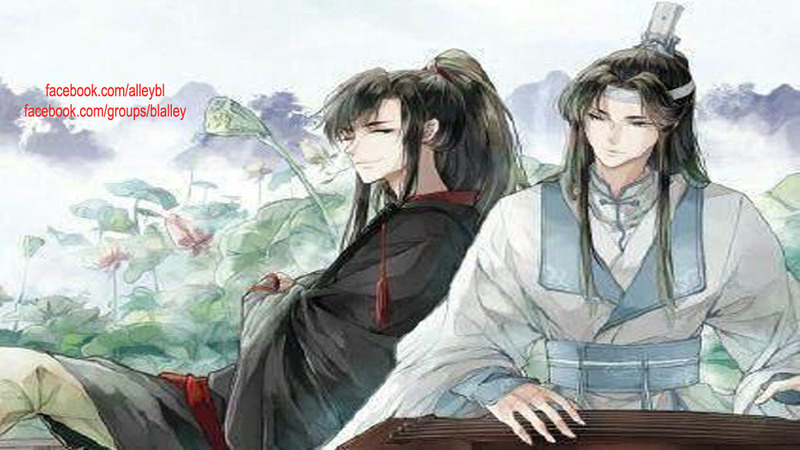 Wei Wuxian then realized, he had gone the wrong way down the mountain, and had taken the wrong fork in the road. Leading the donkey, he came to the edge of a creek. The moon had begun to rise and the creek bank was empty, not having a single branch or leaf to give shelter. The creek’s surface was cracked with white frost. Inverted in the water, Wei Wuxian at last saw his face rippling with the flow of the creek. He roughly splashed the water with a hand, dispersing that ridiculous image. Raising his dripping palm, using the creek water, with a few strokes he erased the powder. Reflected in the water, was an extremely refined, outstanding young man. Clean, as if refined by moonlight, his brows stretched over bright eyes. The corner of his mouth was slightly curved. As he gazed down at himself with head bowed, like tears, drops of water continuously collected on his eyelashes and dripped down. This is a young and unfamiliar face, not the Ancestor Yi Ling Wei Wuxian who once had overturned the sky and the earth, releasing bloody rain and foul-smelling winds. Staring at this face for a long time, Wei Wuxian wiped his face a few times again. Rubbing his eyes he sat heavily at the side of the creek. He had thought that his heart was like stone, but in the end the feelings were still there. The little flower donkey seemed to realize he was in a bad mood, for once it did not impatiently call out. Quiet for a moment, it flicked its tail and left. Wei Wuxian sat at the creek side with no reaction at all. It looked back and pawed its hoof, Wei Wuxian still continued to pay it no attention. The flower donkey resentfully returned, using its teeth to bite Wei Wuxian’s lapel, it tugged at him. Between walking and not, Wei Wuxian was fine either way, but since the donkey was pulling him along, Wei Wuxian chose to walk. The flower donkey led him to a few trees encircling a patch of grass. Within the still underbrush lay a single yin yang pouch. Hanging suspended above was a single broken gold net. It seemed it had dropped from an unlucky cultivator during his struggle to get free. Wei Wuxian picked up the bag and opened it. Inside was an assortment of many objects, a medicine wine gourd, talisman seals, a small demon illuminating mirror, and so on. Fishing about for a moment, he happened to pull out a talisman which suddenly flared up into a ball of fire. The item burning up was a single yin igniting talisman. As the name implied, yin energy served as fuel. When encountering yin energy it automatically catches fire, the stronger the yin energy, the more vigorously it burns. Currently it was burning very fiercely. Since it began to burn as soon as it was taken out, it indicated to Wei Wuxian that the source of the yin spirit was close by. Seeing the flame, Wei Wuxian guarded himself with close attention. Holding up the talisman he attempted to sound out a direction.Turning to the east the intensity of the flame died down, turning to the west the flame suddenly leapt up. Taking a few steps towards that direction, he saw a white stooped silhouette appear beneath a tree. The talisman having been completely burned, the embers then fell from his fingertips. An old man, his back towards him, made muttering noises. Wei Wuxian approached slowly, the muttered words from the old man’s mouth becoming clearer. A few steps brought him to one side, turning towards the old man’s body he leaned over and finally saw a large bloody hole in his forehead. This was merely a dead soul, most likely someone had murdered him with a blow to the head using some sort of weapon. He was wearing burial clothes, the material and workmanship were excellent, indicating that he had been carefully buried. He was not a living being but a lost soul. But, this type of spirit definitely should not appear on Dafan mountain. Wei Wuxian, unable to figure out this irrational place, and feeling uneasy, jumped onto the donkey’s back. Swatting it with his palm, he shouted out, spurring it towards Jin Ling and the rest heading in the direction of the mountain. Immediately he urgently rushed in the direction of the Tian Nu shrine. The sluggard got married, the lightning struck the coffin, the ravenous wolf killed the fiancé, one after the other the father and daughter lost their souls, gorgeous burial clothes… like beads, joining together to form a complete line. It was no wonder that the fengxie board couldn’t point to a direction and the zhao yin flag didn’t work. They all underestimated this thing within Dafan mountain. It wasn’t at all what they thought it was!